Nuts and seeds are an important component of a plant-based, vegan diet and one of the nuts that we grow on the GoMacro farm is the American Hazelnut (Corylus Americana). We grow it because it reduces soil erosion, sequesters carbon and is a great wildlife habitat loved by squirrels, woodpeckers, turkey, and grouse, as well as many insects. In fact, the American Hazelnut is a host plant to the caterpillar of the beautiful Luna Moth. Although smaller than the popular Turkish hazelnut, it has an excellent taste and ongoing research will perhaps make the US more competitive. It is also an important source of mono-unsaturated, heart-friendly fatty acids, as well as many vitamins and minerals. There’s nothing wrong with a little chocolate now and again, and since I had just purchased vegan chocolate by one of my favorite vegan chefs, Fran Costigan, I decided to make her "Six-Layer Hazelnut Chocolate Cake." She calls it the “fastest showstopper in the book.” Six layers is no mean feat but with my chocolate hazelnut butter already made, I decided to go for it. 1. Preheat oven to 350 degrees. Oil the sides and bottom of a 17 ½” x 13 ½” x 1” baking pan and line the bottom with parchment paper. 2. Pour 1 cup of the soy milk into a small bowl. Add 1½ teaspoons of lemon and set aside to clabber. 3. Sift together the all-purpose flour, pastry flour, sugar, arrowroot, baking powder, baking soda and salt into a medium bowl. 4. Add the oil and vanilla to the clabbered milk and whisk together. Immediately add to the dry mixture and whisk until the batter is smooth. Stir in the hazelnut meal. Spread the batter in the prepared pan. It will be a thin layer. 5. Bake for 15 minutes or until the sides pull away from the pan and a wooden toothpick comes out clean. Let the cake cool for five minutes and run a thin spatula around the sides to release the cake. 6. Refrigerate the cake until cold. Cut lengthwise into three equal strips and then cut the three strips in half to make six strips of equal size. Chill or freeze the strips by layering them in saran wrap until cold. 7. To make the glaze pour the milk into a small saucepan, add the sugar and salt and bring to a low boil. Remove from heat and pour over the chopped chocolate. Cover with a plate and let stand for 4 minutes. Add the vanilla and whisk. Let sit at room temperature for 15 to 25 minutes until it coats a spoon with minimal dripping. 8. 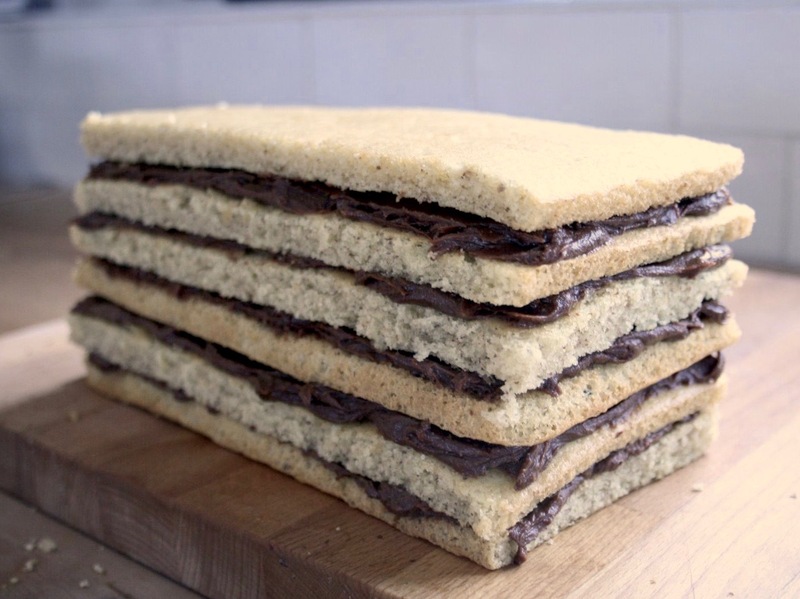 When the cake is cool spread each layer with hazelnut butter and stack so you have six layers. The edges may be a little uneven. Chill the cake in the refrigerator. When cool trim the sides and spread with the glaze. 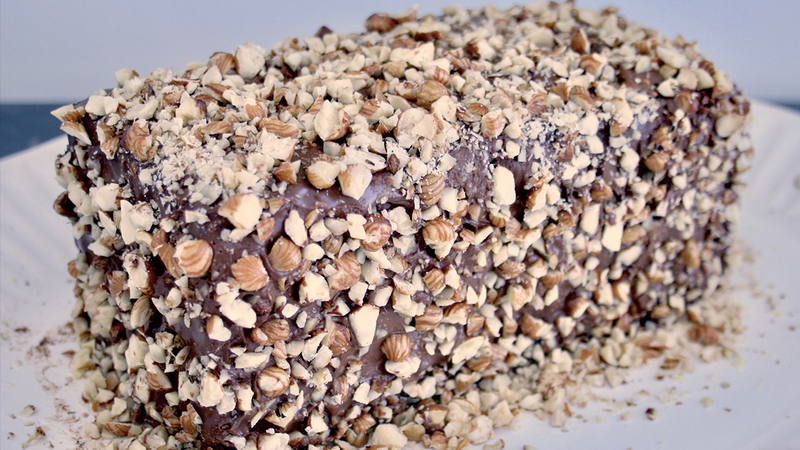 Sprinkle chopped hazelnuts on the sides and top. Refrigerate until the glaze has set. If not serving immediately move the cake to the freezer and wait until the glaze is no longer tacky before wrapping with plastic wrap.